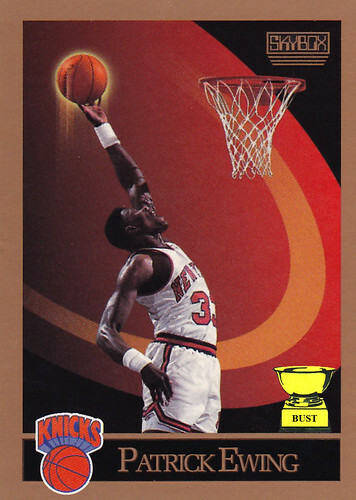 Thoughts on the 1990-91 SkyBox set: The 1990-91 SkyBox set was frickin' awesome. Gone were the days of boring old basketball cards, what with the players just dribbling or passing or dunking. Now we had the future: our favorite hoops stars dribbling or passing or dunking IN FRONT OF EXCITING, COLORED GEOMETRIC SHAPES!!! Plus, the basketball was usually glowing to some extent. Hell, even white-baller all-star Kurt Rambis got fired up for that. Thoughts on Patrick Ewing: Patrick Ewing's knees were made of glass and cardboard, as well as some sort of insulation that made him sweat constantly. It was all very unfortunate.